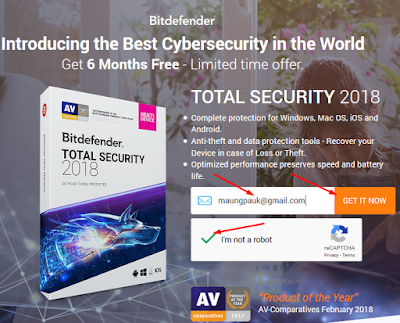 Bitdefender Total Security 2018 ဟာ Windows PC ေလာကမွာ နာမည္ႀကီးတဲ့ Antivirus တစ္ခုပါ.. multi-layer ransomware protection, two way firewall, browsing protection, parental controls, encryption စတဲ့စနစ္ေတြနဲ႔ ကိုယ့္ PC ကို ကာကြယ္ထားႏိုင္ၿပီး Windows PC ေတြအတြက္ တကယ္အားထားရတဲ့ Antivirus Software ျဖစ္ပါတယ္.. Bitdefender Total Security 2018 ကို သူ႔ကုမၸဏီက တရားဝင္ ၆ လစာ အလကားေပးေနပါတယ္..
1. ေအာက္ကလင့္ကိုႏွိပ္ၿပီး email ျဖည့္၊ I'm Not robot ဆိုတဲ့အကြက္ေလးကို အမွန္ျခစ္ၿပီး Get IT Now ကိုႏွိပ္လိုက္ပါ..
2. ကိုယ့္အီးေမးထဲကို Link တစ္ခုဝင္လာပါမယ္.. အစိမ္းေရာင္ Install BitDefender ဆိုတာကိုႏွိပ္ေပးလိုက္ပါ.. Create One ကိုႏွိပ္ၿပီး အေကာင့္ဖြင့္လိုက္ပါ.. Installer တစ္ခု ေဒါင္းခိုင္းပါလိမ့္မယ္.. ေဒါင္းလိုက္ၿပီး Install လုပ္လိုက္ပါ.. အင္တာနက္ဖြင့္ထားရပါမယ္.. 444 Mb ရွိတဲ့ဖိုင္တစ္ခုေဒါင္းၿပီး Install လုပ္ေပးပါလိမ့္မယ္..
3. 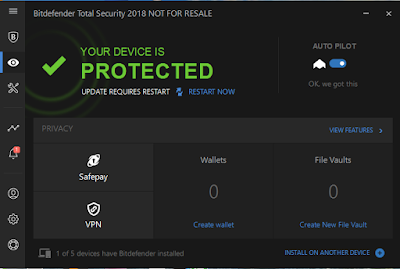 ဒါဆိုရင္ Bitdefender Total Security 2018 ကို ၆ လစာ တရားဝင္လိုင္စင္နဲ႔ အလကားသံုးႏိုင္ပါၿပီ..
Bitdefender Total Security 2018 ဟာ Windows PC လောကမှာ နာမည်ကြီးတဲ့ Antivirus တစ်ခုပါ.. multi-layer ransomware protection, two way firewall, browsing protection, parental controls, encryption စတဲ့စနစ်တွေနဲ့ ကိုယ့် PC ကို ကာကွယ်ထားနိုင်ပြီး Windows PC တွေအတွက် တကယ်အားထားရတဲ့ Antivirus Software ဖြစ်ပါတယ်.. Bitdefender Total Security 2018 ကို သူ့ကုမ္ပဏီက တရားဝင် ၆ လစာ အလကားပေးနေပါတယ်..
1. အောက်ကလင့်ကိုနှိပ်ပြီး email ဖြည့်၊ I'm Not robot ဆိုတဲ့အကွက်လေးကို အမှန်ခြစ်ပြီး Get IT Now ကိုနှိပ်လိုက်ပါ..
2. ကိုယ့်အီးမေးထဲကို Link တစ်ခုဝင်လာပါမယ်.. အစိမ်းရောင် Install BitDefender ဆိုတာကိုနှိပ်ပေးလိုက်ပါ.. Create One ကိုနှိပ်ပြီး အကောင့်ဖွင့်လိုက်ပါ.. Installer တစ်ခု ဒေါင်းခိုင်းပါလိမ့်မယ်.. ဒေါင်းလိုက်ပြီး Install လုပ်လိုက်ပါ.. အင်တာနက်ဖွင့်ထားရပါမယ်.. 444 Mb ရှိတဲ့ဖိုင်တစ်ခုဒေါင်းပြီး Install လုပ်ပေးပါလိမ့်မယ်..
3. 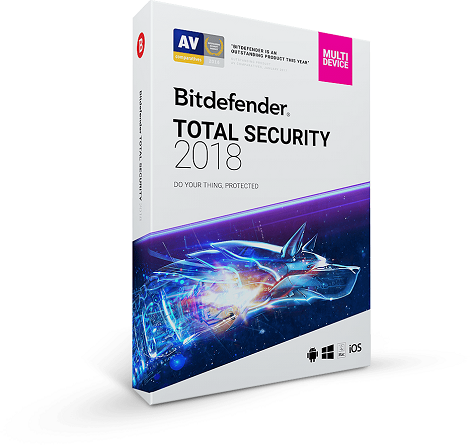 ဒါဆိုရင် Bitdefender Total Security 2018 ကို ၆ လစာ တရားဝင်လိုင်စင်နဲ့ အလကားသုံးနိုင်ပါပြီ..